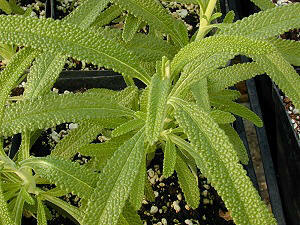 Black Sage is a native California beach sage that has highly aromatic pebbled leaves and pale blue flowers in late winter. It makes a great addition to our Zone 8-11 Fragrant Garden Six Pack. This plant is sometimes available in plug trays. These trays hold 128 of all the same plant. They are a great low cost way to fill a lot of space. Each cell is 3/4 of inch by an inch. Check here to see if Black Sage Plug Trays are available.